Building incredible flavor in a single skillet is one of the smart tricks pro cooks use to get food on the table fast. 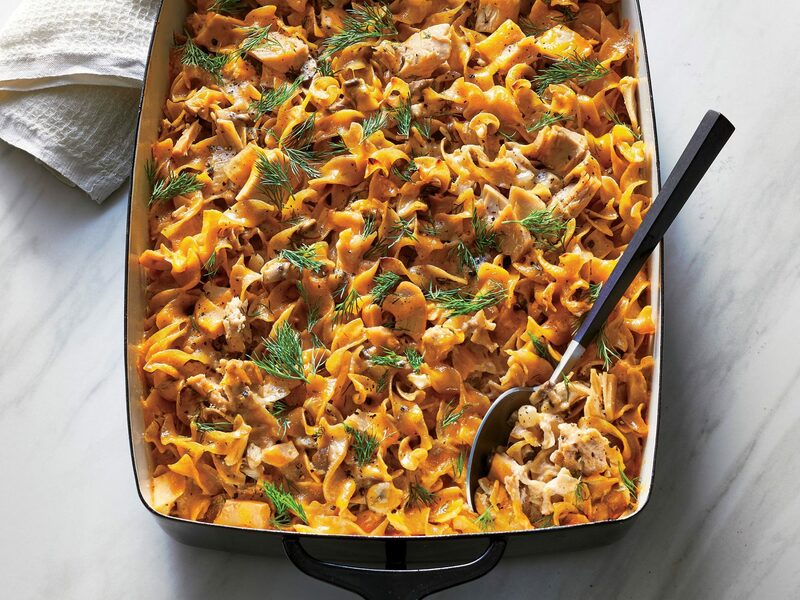 That said, you’ll actually need 2 skillets—a 12-inch nonstick for cooking and a 10-inch cast-iron for weight—to make this fabulous chicken-under-a-brick inspired dinner. The heavy cast-iron acts as your “brick,” which is essential to getting glorious crispy skin and helps speed up the cooking. You could also use a large brick or tile wrapped in aluminum foil for the same effect. The result is super juicy chicken, with ridiculously crisp skin, ready in a fraction of the time it would typically take to cook whole chicken breasts on the stovetop. And once you throw marinara saucy and melty mozzarella into the mix… well, you’ve got a weeknight recipe the family is going to beg for again and again. 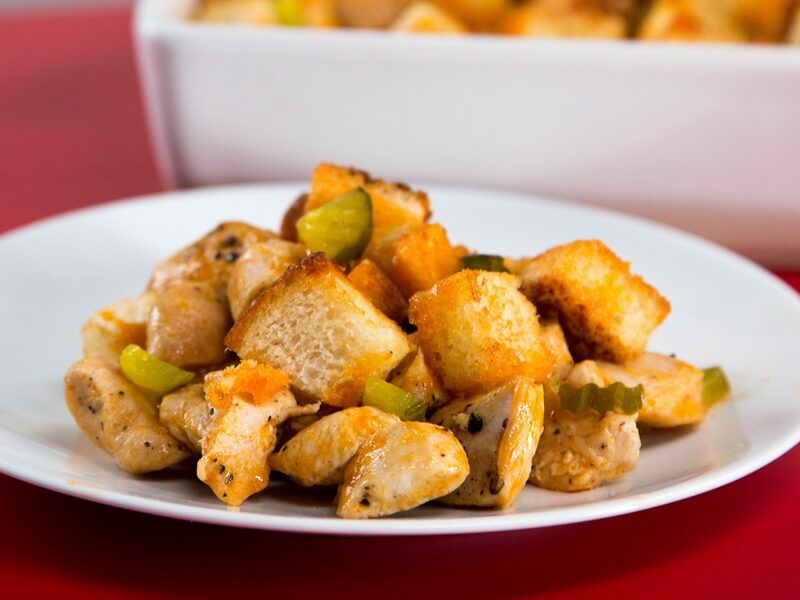 Serve the completed saucy-cheesy chicken over pasta or on toasted hoagie rolls. 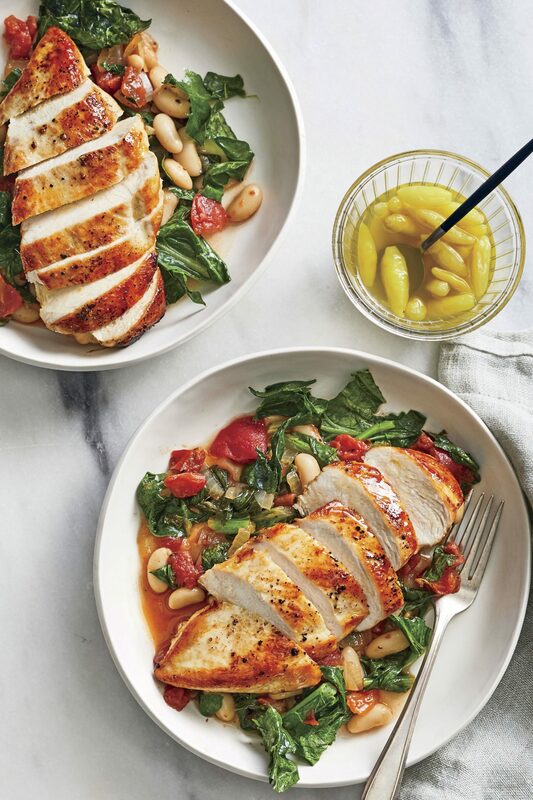 Learn how to make this easy, 30-minute lemon chicken dinner that doubles as an impressive dinner-party dish or quick-cooking weeknight meal. 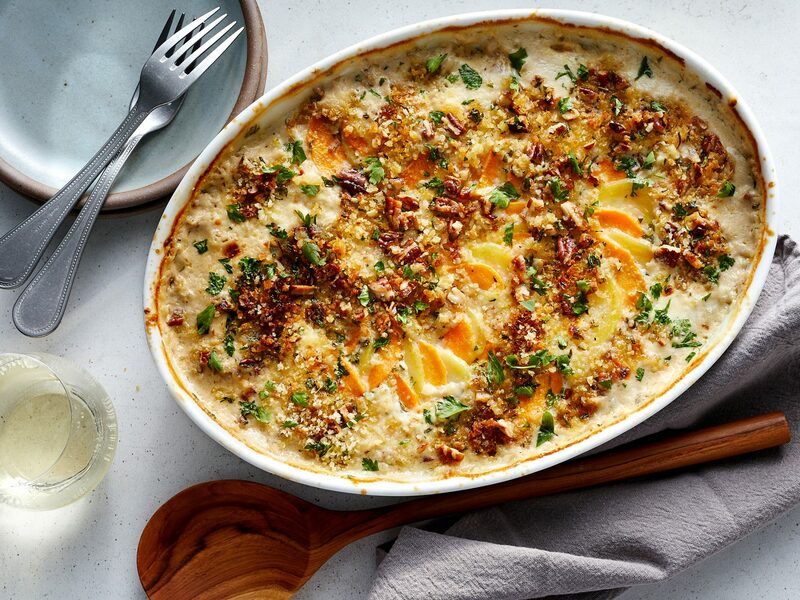 Butternut squash puree enhances the color of this one-dish wonder without distracting from the cheesy flavor, and it sneaks in another serving of vegetables. This dish comes together in just one pan, making for quick cleanup and tons of flavor as the elements build on each other. Rice and broth are added to sautéed chicken and mushrooms for a simple entrée that requires only one pan. These enchiladas are a cinch to assemble and easy to freeze--just cover one of the pans with foil. This hearty one-pot meal will transport you to New Orleans on the busiest weeknight. Like it spicy? Serve with hot sauce on the side. 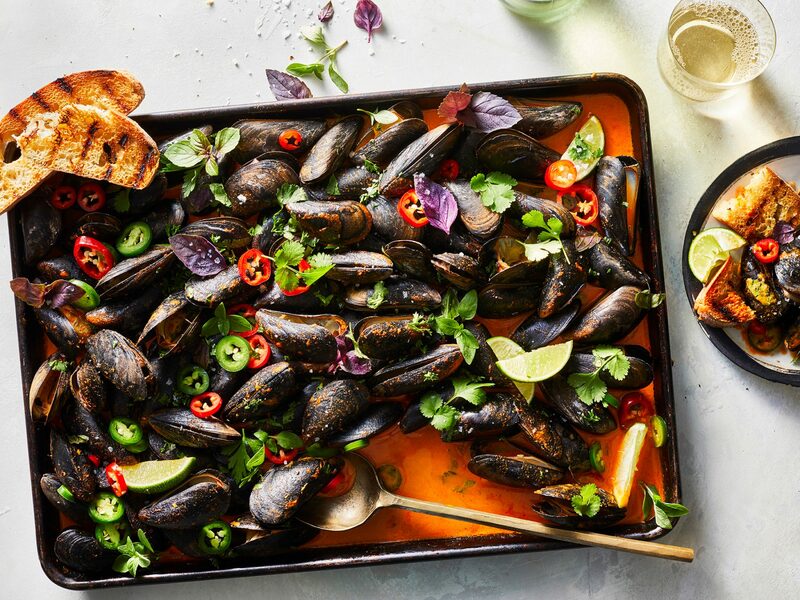 Light and healthy, this no-fuss fish supper takes just 15 minutes to make. 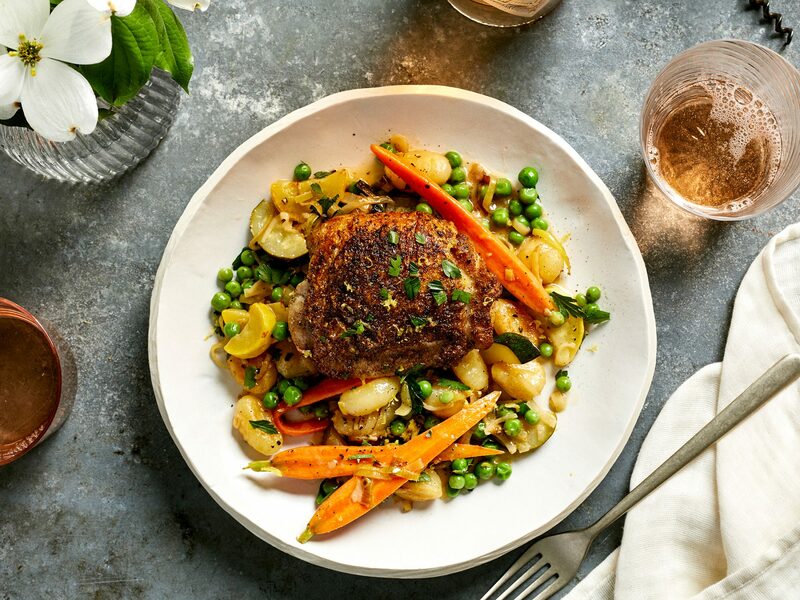 One-skillet dinners like this one make weeknight cooking a breeze—and since it comes together in 30 minutes, you spend less time cooking and more enjoying the meal. Starting the chicken in a cold skillet renders flavorful fat that crisps up the chicken and potatoes to golden perfection. 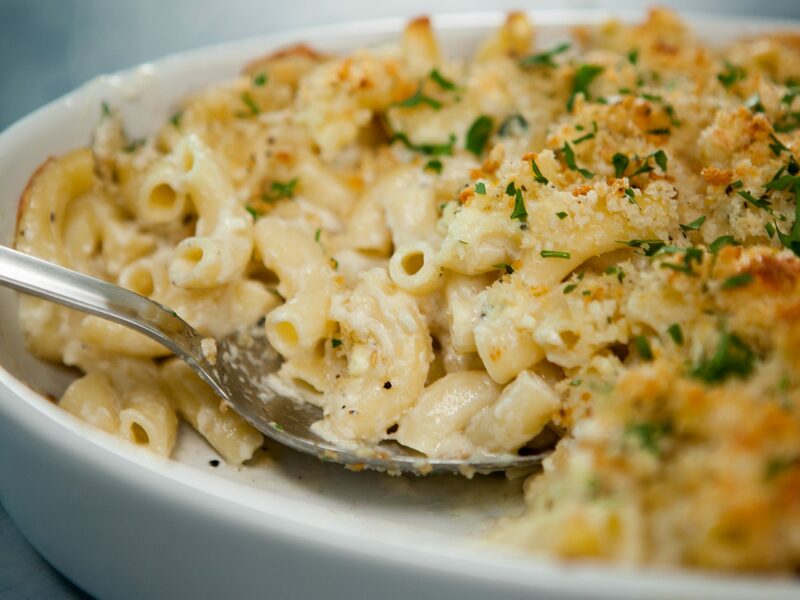 Use a cast-iron skillet; its even heat distribution delivers delicious results. Scoring the skin allows for fast, even cooking and supercrisp texture. Look for snapper from the Gulf of Mexico, or use one of the recommended substitutes. The quintessential comfort food, chicken and dumplings is the classic one-pot chicken dinner. Look for farm-raised lake trout, an environmentally friendly choice. If you can't fit all four fillets in one pan, divide the oil in half and cook in batches of two. Twenty minutes are all you need to transform a plain package of chicken thighs into a delicious Mediterranean-inspired one-dish dinner. The original recipe for this comforting one-pot dish from River Road Recipes called for "boiling a hen in seasoned water." We've adapted it for today's cooks. This simple one-pot recipe is easy and quick enough for a weeknight dinner. Feel free to substitute ground beef for the lamb, and in season, try fresh peas for frozen, cooking them a little less time. Cajun Chicken Cassoulet is our Southern take on the classic slow-cooked French dish. In this one-pot meal, we incorporate Cajun ingredients such as Cajun smoked sausage, seasoning, and sliced okra--and our cassoulet doesn't cook all day. Garlic-Pork Stir-Fry is a one-wok wonder that will satisfy the appetites of your hungry crew and meet your desire for a simple, fast dinner. This hearty chicken dish is the epitome of a comfort food classic. It doesn't get better than chicken marsala, spaghetti noodles, and fresh veggies. Dinner is ready--thanks to this one-dish meal of Steamed Fish with Ratatouille. The vegetables--zucchini, eggplant, bell pepper, tomatoes, and onion--create a built-in side dish with the steamed fish. For winter comfort, turn to this one-pot meal of Pumpkin-Shiitake Risotto with Pancetta and Pine Nuts. Pancetta, or Italian-cured pork belly, adds a meaty note to this smooth pumpkin risotto blend. Mascarpone cheese adds a creamy and slightly sweet flavor that balances the salty flavor of the pancetta and pine nuts. To toast your pine nuts, stir them constantly in a skillet over low heat until they are golden brown and there's a warm, nutty smell. Keep a close eye, as they can burn quickly. Grilled Asian Flank Steak with Mango Salad delivers a wonderful combination of flavors, and this one-dish meal is on the table in just 40 minutes. The mango adds a nice sweetness to the overall dish while the peanut butter adds a mild peanutty flavor to the dressing. This pasta dinner is a game changer: You use just enough liquid to cook the pasta--no colander needed. For slow-cooked comfort, Brisket with Root Vegetables delivers every time. Put this one-dish meal in the slow cooker in the morning and dinner is ready and waiting 8 hours later! For a quick dinner, cook up Thai Spring Beef Stir-Fry. You'll hardly need any oil when you sitr-fry this one-dish meal in a cast-iron skillet.